How does VibroMetra licensing work? VibroMetra uses license key files which are activated by right mouse click on the respective channel of the "Measuring Channels" in the main window. A license key is valid only for one particular channel of a M302 or M312 IEPE/USB interface with a particular serial number. This information is needed when you order a license key. For each software instrument (VM-METER, VM-SCOPE etc.) one license per channel is required, i.e. for a triaxial instrument, like VM-STRUC, you need three licenses. For more than one channel we offer quantity discounts. The license key is stored inside the M302 so that it is independent of the PC where you run VibroMetra. The licensed instruments are available as soon as you connect your M302 to a USB port. How can I test VibroMetra? On our download page we offer a free trial version of the VibroMetra software. This is the full software package including all instruments. 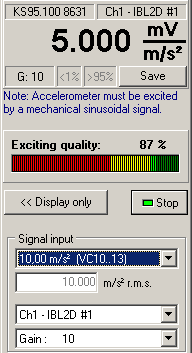 Start the program as "VibroMetra Simulator". Instead of connecting the M302 or M312 hardware you may use simulated signals. The simulation menu opens after a right mouse click in the measuring channels window. Yes. The system includes a calibration function which allows to calibrate the entire measuring chain from the sensor to the display in one step using a vibration calibrator. Can the system be operated for a longer period on an unattended PC? Yes. VibroMetra software is characterized by high stability. Particularly suited for long-term measurement are the instruments VM-PLOT and VM-REC. VibroMetra systems have been running in industrial environments for several years without interruptions. Even after an abnormal system end the measurement will proceed normally. All you need to do is putting a link to VibroMetra into the autostart folder of your PC and selecting the check boxes "Save settings at end" and "Restore sensor connections" in the Workspace settings of VibroMetra. Why do I get unstable or too high results when I measure displacement? Set the high pass filter to at least 3 Hz, to suppress low frequency noise. Low frequencies are amplified by the integrators. How can I export measuring results from VibroMetra into other software? To make VibroMetra as stable and simple as possible we decided to limit the number of export formats to a minimum. Most instruments with graphical output feature an export function for the graphics as Bitmap, EMF or text file. VM-REC records the measured values on hard disk which allows to process them later by external data analysis software, for example FlexPro. The logger data can be exported either as binary file or in text format. The raw data recording function of VibroMetra Online also offers export capabilities. Load the recorded raw data file (*.ids) into VibroMetra Offline and export is to a text or binary file. For this purpose the options VM-TXT or VM-BIN need to be installed. How can VibroMetra display time graphs of vibration signals? Slow changing vibration signals may be recorded as RMS or peak values by VM-PLOT in the way a strip chart recorder does. Real-time recording of the instantaneous value for short vibration events can be performed using VM-SCOPE. Can I use VibroMetra on several PCs even if I have only one software license? Yes. The software key is installed inside the M302 or M312 hardware and will be recognized by the system as soon as you plug in the device, provided the VibroMetra software was installed. How many M302 units can I connect to one PC? Tests have been made using up-to-date PCs with up to 20 M302 devices, i.e. 40 measuring channels. Several instrument windows can be opened for each measuring channel without data loss or delay. Such multichannel systems are set up with active USB hubs. How does offline measurement work? VibroMetra can save the real-time signal of the M302 or M312 on hard disk. You only need to enter a file name and to activate a check box in the VibroMetra main window. After switching on a software instrument, VibroMetra will save the raw signal on hard disk. This happens in the background while you measure as usual. To recall stored data, start "VibroMetra Offline". You will see a time bar graph for each channel that was saved. As known from other play-back devices you will find the buttons play, fast forward, rewind and stop. After clicking the play button, all activated software instruments will start measuring with the data from hard disk. Does the M302 measure with the full sampling rate when both channels are active? Yes. Both channels are sampled with 10 kHz and have a bandwidth of 2 kHz. Are there M302 or M312 drivers for other software? Why is only one M312 sending data? If you want to measure with more than one M312 you need to interconnect them by synchronization cables VM-SYNC. Why does data acquisition stop sometimes? Your system may be overloaded. Please check the CPU load indicator in VibroMetra Online. If it shows over 100 % you should reduce the display refresh rate in the "Displaying" menu or close some instrument windows. The rotary speed detection of my VM-BAL does not work reliably at higher speed. No rpm value is displayed. The photoelectric reflex VM-PS switch needs for detection a certain pulse length. If the reflective sticker is very small, the impulse duration may be too short. Use a longer strip of the material to cover a larger portion of the rotor circumference. My photoelectric reflex switch does not work. VM-BAL does not display the rpm value even if the LED of the VM-PS sensor flashes. The power supplied from your PC via the USB interface may be too low. This problem so far only occurred when a USB extension cable was used and the cable resistance became too high. I want to see low frequencies in high spectral resolution but also observe higher frequencies. Why does VM-FFT not have a logarithmic frequency axis? - Display the lower frequency range with high resolution in the second window.